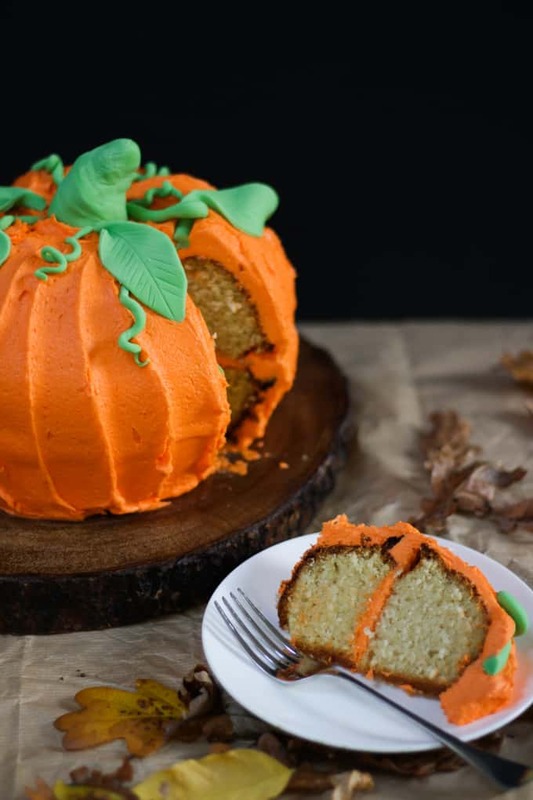 How to make a Pumpkin Bundt Cake – Perfect for Halloween, this easy peasy cake is so much fun to make. 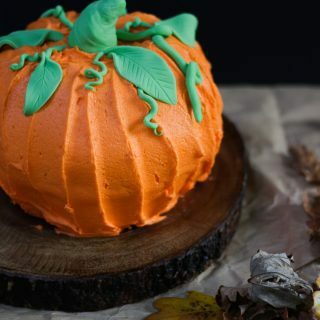 Filled with buttercream icing – the best frosting – kids will love this bake. It’s almost here, the most spook-tacular time of the year! (See what I did there?) Halloween! We never really celebrated halloween at all when I was growing up. Whilst I’m still a through and through scaredy cat it feels like a chance to embrace the season that I love so much and make some fun for the children. 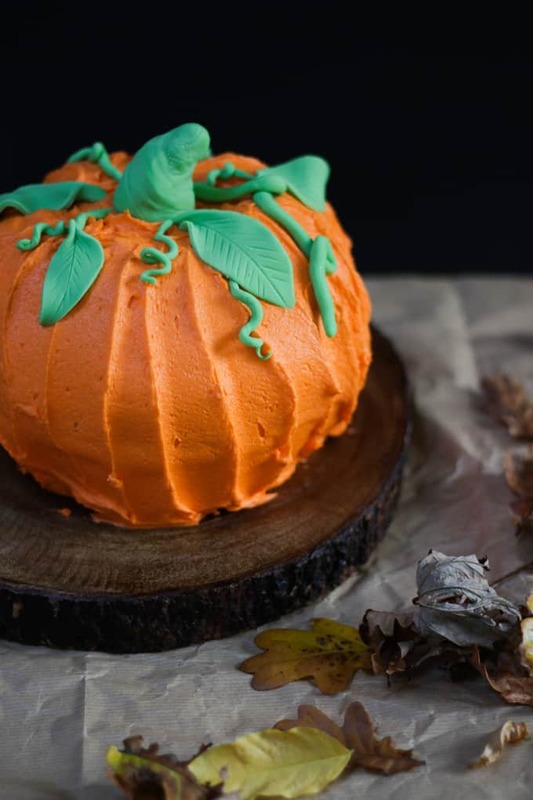 So, we dress up and I make the house a little spooky and of course, there is cake. Always cake. 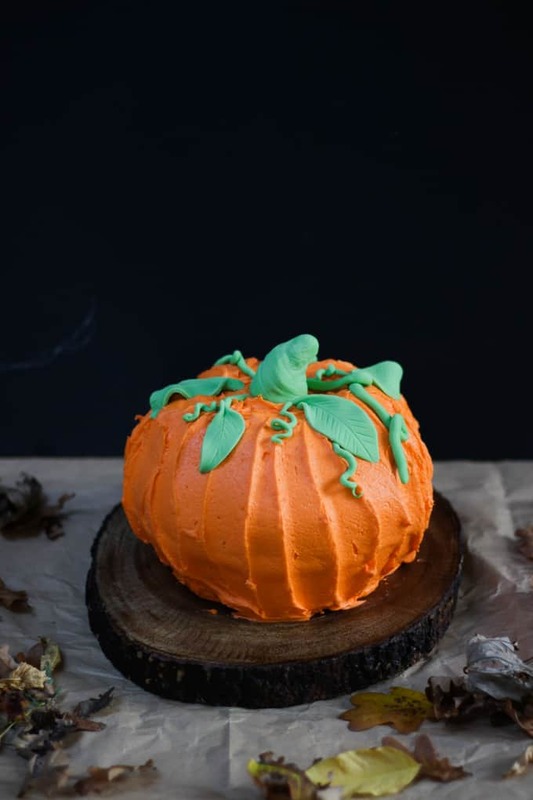 My little pumpkin loaf cakes are one of the most popular posts on my blog, but the kids do tend to prefer something a little more simple. This cake ticks all of the boxes. Suitable for child tastes, really easy and a bit of a show stopper. Hurrah! Read on for tips on how to put this cake together and also to watch the video tutorial. 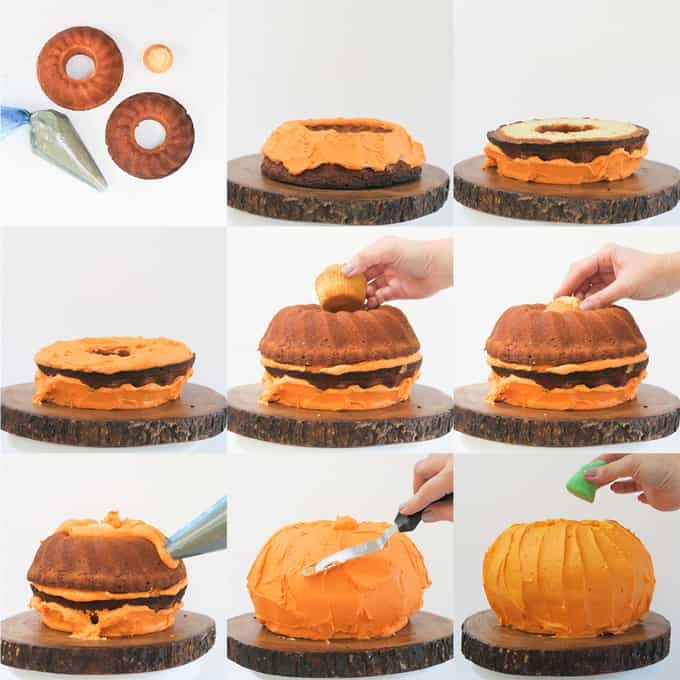 I used a basic Victoria Sponge recipe in these bundt tins from Amazon: KitchenCraft MasterClass Non-Stick Fluted Ring Cake Tin, Grey, 27 cm This is the perfect pumpkin shape! Be sure to butter your tin REALLY well. It makes all the difference to getting the cake out. When your cakes are ready and cooled, trim them down well so that they sit firmly on top of each other. My favourite tool to get the ridge in the icing is my trust palette knife. Such a good investment! On Amazon: Oxo Good Grips Palette Knife. 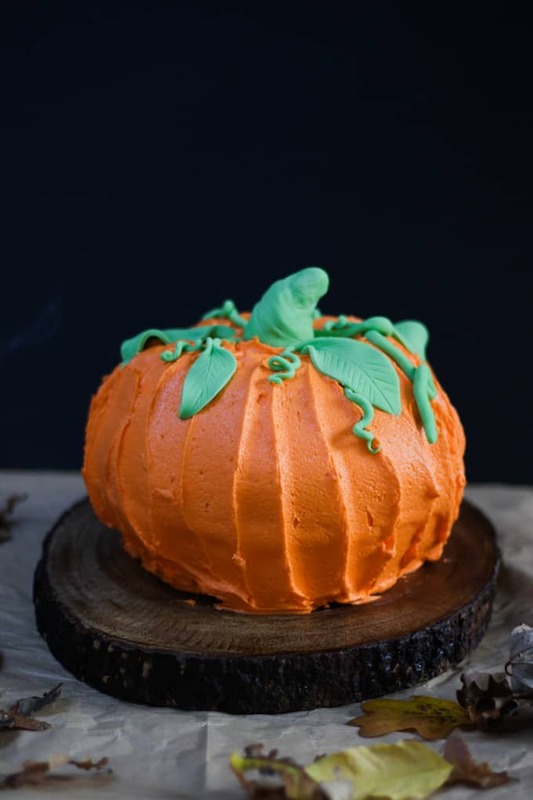 PLEASE whatever you do, DO use paste food colouring for the icing! This cake WILL NOT WORK using liquid food colours and even with supermarket gel/paste colours, the result will not be half as good as investing £3 ish in some brilliant colour! You only need a small amount and it will last for ages. 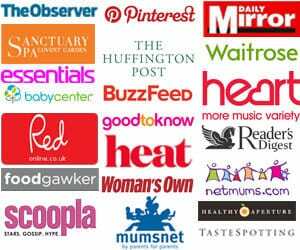 This is the paste I’ve used here and it’s the only brand I use and recommend, available on Amazon: Sugarflair Paste Food Colour in Tangerine. If you like the wooden cake plate/stand, there’s a similar one on Amazon here. 750 g Unsalted butter at room temperature. To make the batter, put either all or half of each ingredients into a mixer, or by hand, and beat well until totally combined and fluffy. Put two cupcake liners into a cupcake tin and pop in a scoop of batter to each one. Put the remaining mixture into a very well buttered bundt tin and bake for about 40 minutes or until cooked through. Add the cupcakes to the oven for 15 minutes (so after the bundt cake has been in the oven for 25 minutes already). Meanwhile make the icing. Beat all of the ingredients in your mixer, with a hand mixer or by hand until very soft. Add a splash or two of boiling water if the mixture is too stiff. Put your cakes together as directed, shape leaves and a stalk and add to the iced cake.